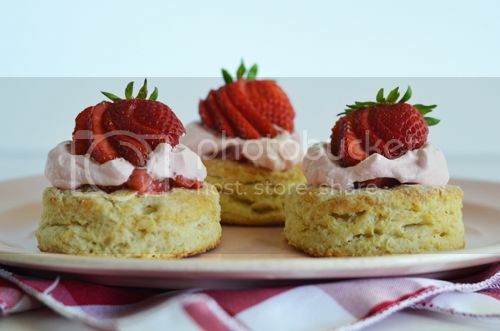 Celebrate National Strawberry Shortcake Day with Driscoll’s & Dorie Greenspan! If you love strawberry shortcake as much as I do, then tomorrow is a special day for us. 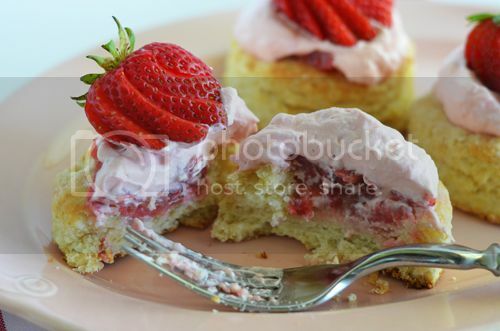 June 14th is officially National Strawberry Shortcake Day! And the folks at Driscoll’s have asked Dorie Greenspan to create an incredible shortcake recipe to celebrate! If you saw the photo I posted last month, you might remember that I was one of a handful of bloggers to participate in a Google Hangout on Air with Ms. Dorie. We chatted for about an hour and she let us in on several of her baking secrets (a few of which I’ve listed below). 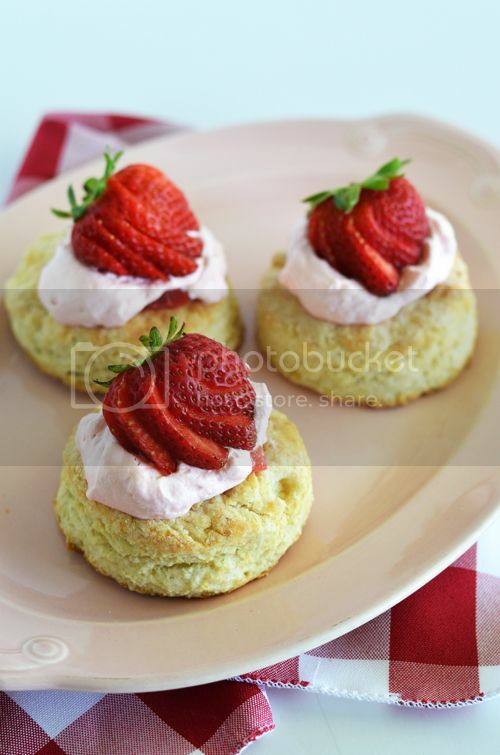 – Buttermilk biscuits should be light, as to taste the berries and cream as the top notes. – Add lemon zest directly to the sugar and work it in with your hands, so that it’s fragrance is used to it’s full ability. – Any metal cutters with a high, clean edge (and not serrated) will do. Be forceful, but cut straight down and don’t twist! Lift straight up to remove each biscuit from the dough. – Check your baking powder and make sure the expiration date hasn’t passed. – Use extremely cold cream and butter for the best results. – When cutting the butter into the flour, your hands are the best tool! Work until pieces are the size of oatmeal or small peas. Driscoll’s is 4th-generation family owned, where teams of people work specifically with each of the four berries grown on property: strawberries, raspberries, blackberries and blueberries. And while Dorie was visiting Driscoll Ranch, she tasted twelve different variations of the strawberry. Twelve! Can you believe it? We also learned that strawberries are family members to the rose. And since their flavor notes are so similar, rose extract pairs beautifully with the berries in Dorie’s newest dessert recipe. These shortcakes are anything but ordinary, thanks to the pink tint of the whipped cream and subtle floral flavor in the biscuits. Even though the recipe seems long, it really isn’t. A few of the steps can be completed hours or even a day before serving. So, start on these today, throw a picnic tomorrow and serve these to celebrate National Strawberry Shortcake Day! Several hours ahead or the day before, separate the rose petals, rinse them quickly in cold water and pat them dry. Put one egg white in a small bowl and whisk until it's foamy. (You may or may not need the second white.) Put the sugar in another small bowl and place a sheet of parchment paper or a silicone baking mat on the counter. One at a time, dip a petal into the white and let the excess drip back into the bowl. Drag the petal through the sugar to coat both sides very lightly. Dry the petals on the paper or mat in a cool, non-humid place for at least 6 hours or for as long as overnight. Put the sugar and lemon zest in a large bowl and, working with your fingertips, rub the ingredients together until the sugar is moist and fragrant. Add the rest of the dry ingredients to the bowl and whisk to combine. Drop in the pieces of cold butter and, again using your fingertips, crush, rub and blend the butter in. You'll have flakes of butter and small pieces and this is just right. Pour the cold buttermilk over the mixture, switch to a fork and toss and stir everything together until the milk is absorbed - your dough might look like curds, but that's fine. Don't stir too much, too vigorously or for too long and if there are a few dry spots in the bottom of the bowl, ignore them. Reach into the bowl and knead the dough gently, folding it over on itself and turning it over 6 to 8 times. Dust a work surface lightly with flour, turn out the dough and, still using your hands, pat the dough out until it is 1/2 inch thick. (The thickness is what's important here.) Using a high-sided 2 inch cutter, cut out biscuits and place them on the baking sheet. Pat the scraps together until they're 1/2 inch thick and cut out as many more biscuits as you can. (The leftover dough can be cut into biscuits, but they won't rise as high or as evenly as the others - you can keep them as your baker's treat). Just before you're ready to put the shortcakes together, stand the berries up and, using a thin-bladed knife, cut each berry into 4 or 5 thin slices. If you'd like to pipe the whipped cream, either spoon the cream into a pastry bag fitted with an open star or plain tip, or spoon the cream into a zipper-lock plastic bag and snip off a corner. Alternatively, you can simply spoon on the cream. Disclosure: Compensation was provided by Driscoll’s in the form of product & coupons; however, the photography & opinions expressed herein are solely those of the author. Just beautiful, Jessica! I loved Dories shortcake…thought the hint of rose was fabulous! Lovely photos! Next post: I Scream, You Scream, It’s All About the Ice Cream!